The couple in Erbil, Iraq in 2003. 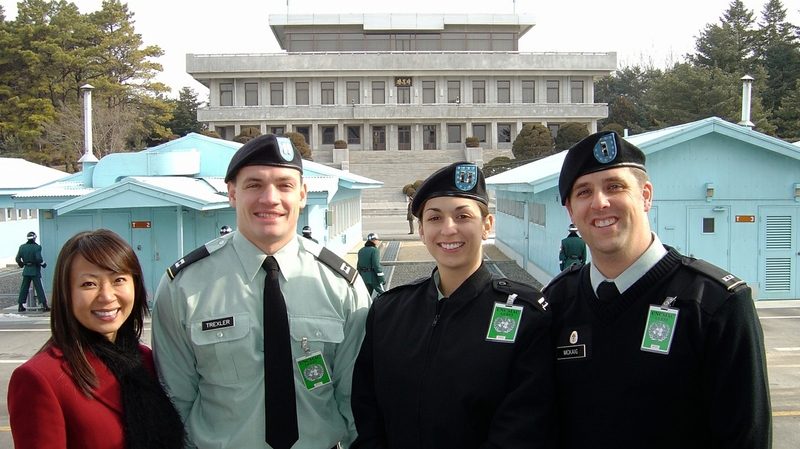 Alissa and Roone in the Korean Demilitarized Zone in 2005. North Korea is behind them. 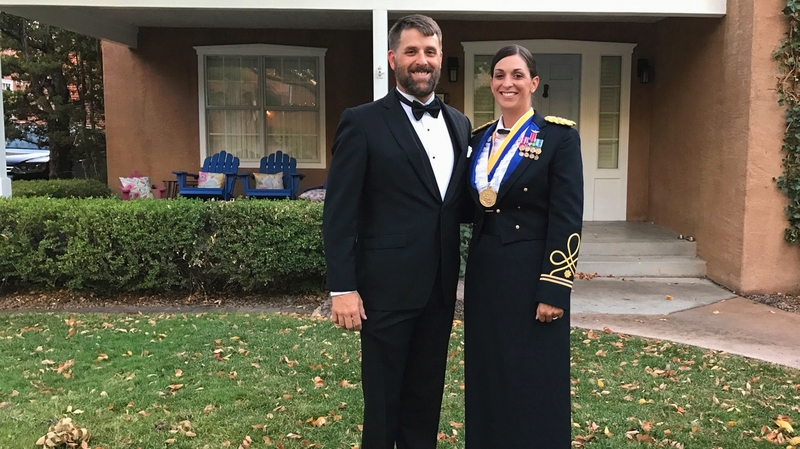 The couple on their way to the 2016 Air Force Ball in Albuquerue, N.M.
Roone and Alissa McKaig share more than a love for aviation, they share a home, a deep commitment to the U.S. Army and a special connection to The University of New Mexico. 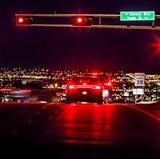 I recently met the unique couple who works day in and day out to support our Lobo community. With matching helicopter licenses, I knew better than to ask a husband and wife team, who is the better pilot. As it turns out, after they told me their story, I knew the answer without asking. “The first five years of our marriage we spent at least half the time apart,” said Roone McKaig, helicopter pilot and husband to Lt. Col. Alissa McKaig. “I missed our daughter’s birth. I was in Egypt at the time and had a flight the next day, but she went into labor. I told her to wait,” he said with a grin. What would cause a riff in most couples—time apart, dueling careers, demands of family, is just the norm for these two pilots. The secret to their success as a couple isn’t just a commitment to each other, but a commitment to our country. Born and raised in Salt Lake City, Utah, Roone joined the Army in 1994. He started his aviation career as a Chinook mechanic for six years in a special operations unit. Roone first met Alissa while he was stationed at Fort Hood. She was a platoon leader at the base, but after developing a friendship, the two were separated. “We had just missed each other in flight school,” said Roone. "We met at Fort Hood, Texas. From there we both deployed to Iraq. When I left Iraq for Korea, Alissa remained and redeployed with her unit. Our paths crossed again, when she also got stationed in Korea about eight months later." While growing up in New Jersey, Alissa became familiar with the ins and outs of the service as her father rose through the ranks of the Army National Guard. He was also a pilot with a passion for flying. After high school, it was her father who encouraged her to take advantage of an Army ROTC scholarship and she did, at James Madison University in Virginia. After college, Alissa entered the Army as a commissioned officer. When it came time to choose a profession in the service branch, her father also influenced that decision. “I thought it was cool to fly because that’s what my dad does, so that’s what I put in for and got,” said Alissa. 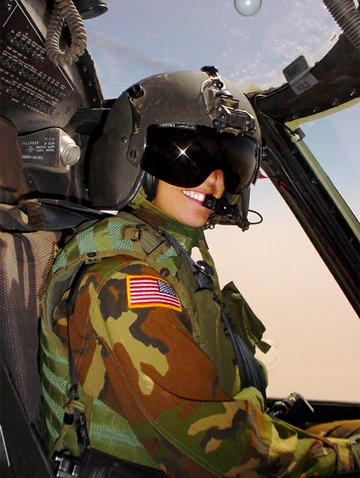 Alissa flying over Iraq in 2003. As Roone and Alissa’s careers went in separate directions, their hearts decided on the same path. 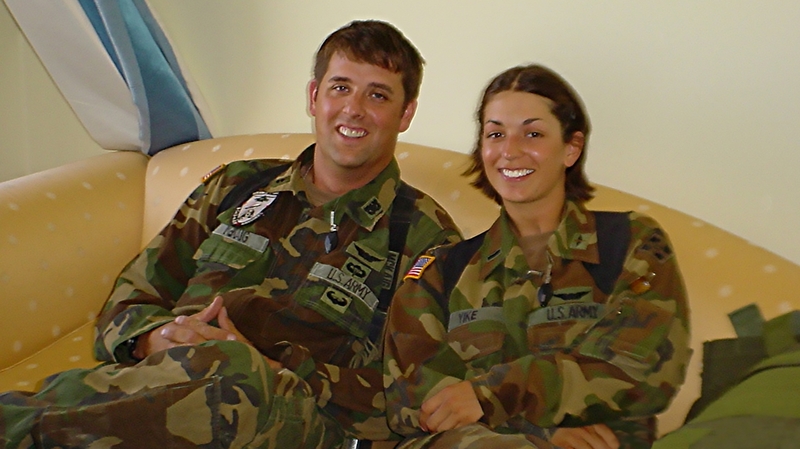 After getting married, Roone was stationed at Fort Rucker as a pilot instructor while Alissa took the opportunity to attend graduate school in San Antonio, Texas. Grad school eventually lead to a teaching position at West Point Military Academy. 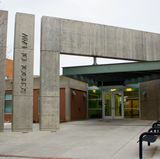 Alissa was stationed at the school for three years teaching Spanish to cadets. During that time, the couple started a family. “I was originally going to join Alissa at West Point, but it ultimately didn’t work out with posts,” said Roone. He ended up extending a deployment in Egypt and staying 19 months. They finally had the opportunity to live together for a brief period when their first daughter was seven months old. The couple had two daughters before relocating temporarily back to Fort Rucker. It was there that the couple was presented with an option that allowed for them to call the same state home. 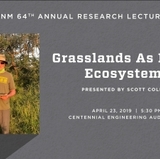 Alissa ultimately accepted a position at UNM as a Professor of Military Science and is in charge of the school’s Army ROTC Unit. This move proved different from the others. The closest place Roone could have been assigned is in El Paso, Texas. With two kids and another on the way, he decided that he had spent enough time away from family. So after two decades, he retired from the Army. “I retired as a Chief Warrant Officer 4 (CW4),” said Roone. “And I haven’t shaved since I left the army,” he laughed. Roone found work related to the University as well. He works for Lifeguard, run by Seven Bar Aviation. The company contracts with UNM Hospital for medivac support. Roone enjoys his new career that includes a new support role at home with the kids, while Alissa develops the next generation of Army officers. It’s that passion and respect for the Army, that has strengthened the bond between the McKaigs. They found being married to one another has built a special understanding, a support system for each other’s daily challenges. But there are challenges for married military couples. “We had different assignment managers, so when I was going to get assigned somewhere his assignment manager would have to look at his career and sometimes they would say, ‘Well that’s not good for your career’ or they would advise you in different ways,” said Alissa. Roone added, “My branch manager, when we first got married, looked at us and said, ‘This doesn’t work, one of you will get out,’ and 99 percent of the time it’s the female. And I look back at that now. We proved him wrong." The compliment from Roone, was not only loving and supportive, but also genuine. As Alissa rose through the ranks of the leadership side of the Army, he rose through the warrant officer ranks, overseeing the standardization of the Black Hawk training at flight school with around 800-900 students, plus 300 flight instructors, before this retirement. 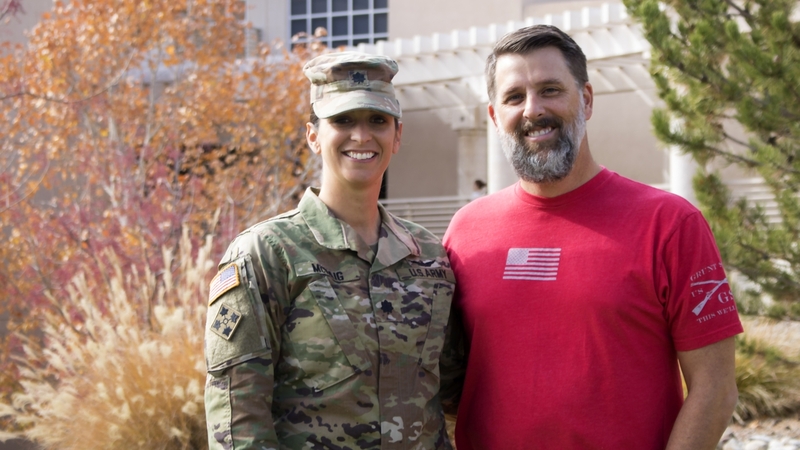 Albuquerque might not be the last stop for the couple as Alissa has recently been selected to serve as a Battalion Commander, but it has no doubt been one of the most special according to her.